PETALING JAYA: The Malaysian Rubber Board (MRB) has awarded the RM1.4bil development on 2.2ha in Jalan Ampang, Kuala Lumpur to Crest Builder Holdings Bhd and its 49% joint-venture (JV) partner Detik Utuh Sdn Bhd, sources said. For the open tender of this land, request for proposals started last June. Various proposals had been submitted by property players which included those from SP Setia Bhd and Naza TTDI Bhd. “Many developers were looking to purchase of the land but MRB declined to sell it as it was looking for a longer term business model with recurring income,” said a source. The land, also known as Lot 76 is opposite the Great Eastern Mall and would be developed over seven years. The development cost would be borne by the Crest Builder and Detik Utuh JV. MRB, as the landowner would receive 22.5% of the project's gross development value (GDV) for land rights, which translates into about RM300mil. The development would include four towers which consist of one office block, two SoFo' (small office, flexi office), and an apartment block atop a retail mall. This development strategy is similar to the RM1.04bil tower atop the Dang Wangi light rail transit station contract which was also recently secured by Crest Builder and Detik Utuh. Tendered out by Syarikat Prasarana Negara Bhd, that project consisted of a mixed development fronting Jalan Ampang where Prasarana would receive 21.2% or RM220mil of the project's GDV as payment of land rights. While Crest Builder is better known as a contractor, it is starting to shift its focus to become a property developer. It currently has a construction orderbook of some RM950mil and unbilled property sales orderbook of RM300mil. With the MRB land and the Dang Wangi project, this would bring its unbilled property orderbook to over RM2.5bil. Some of its previous construction jobs for other developers included Menara Binjai in Kuala Lumpur, North Shore Gardens in Desa Park City, Kepong, and Twins Damansara in Jalan Semantan, Kuala Lumpur. Last Thursday, Crest Builder Holdings Bhd managing director Yong Soon Chow saw his indirect shareholding in the company reduced following the disposal of five million shares or a 4.029% stake. A filing with Bursa Malaysia showed the shares were disposed at 82 sen each for RM4.10mil. He is deemed interested in the transaction where the shares were disposed of by Yong Tiok Chin. It appeared that the shares were sold to strategic investors that were acting in concert with Crest Builder. MRB is embarking on a strategy to monetise its landbank. 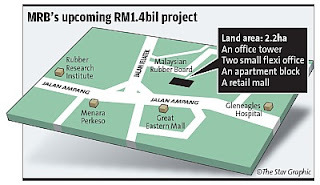 Its most high profile landbank that would be tendered out soon is the development of the Rubber Research Institute Malaysia land measuring 1,215ha in Sungai Buloh, Selangor. MRB's landbank include Menara Getah Asli which fronts the Petronas Twin Towers in Jalan Ampang, the Rubber Research Institute building in Jalan Ampang, and two others, one each in Jalan Stonor and Jalan Lidcol. PETALING JAYA: Sentoria Group Bhd expects to launch projects with a total gross development value (GDV) of RM1.5bil within the next eight years. Public and investor relations head Nasiruddin Nasrun said the projects would be located in Selangor and within the company's Bukit Gambang Resort City (BGRC) development in Kuantan, Pahang. “About RM113.8mil will be for property projects in Kuantan and Selangor, while the balance RM1.4bil will be allocated for BGRC-related developments such as additional hotel rooms and suites and retail outlets to add to its vibrancy,” he told StarBiz in an e-mail. 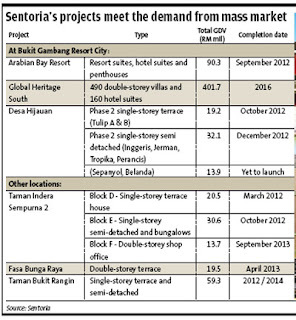 “Going forward, Sentoria plans to launch projects with a GDV of about RM1.5bil, which indicates that the property segment will continue to be a significant revenue generator,” Nasiruddin added. Sentoria currently has three ongoing projects within BGRC and three other developments in different locations. The projects at BGRC are its Arabian Bay Resort (comprising penthouses as well as resort and hotel suites), Global Heritage South (double-storey villas and hotel suites) and Desa Hijauan (single-storey terrace and semi-detached homes). Its other projects are Taman Indera Sempurna 2 (comprising single-storey terrace homes, semi-detached houses and bungalows), Fasa Bunga Raya (double-storey terrace houses) and Taman Bukit Rangin (single-storey terrace and semi-detached homes). “Part of Sentoria's masterplan is to further develop other accommodation and commercial centres in BGRC to accommodate even larger patronage,” he said, adding that the future BGRC-related projects were targeted for completion in 2018. Sentoria also has a number of completed projects Taman Sentoria, Taman Indera Sempurna 1, and Caribbean Bay Resort in BGRC. 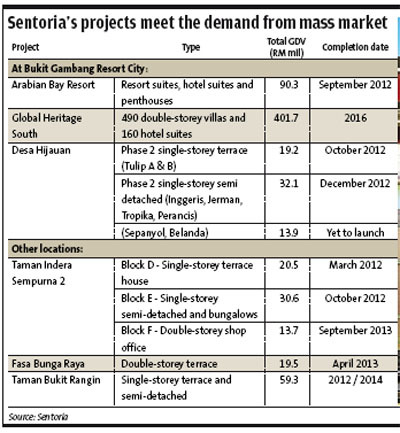 As for developing projects beyond Kuantan, Nasiruddin said Sentoria was “constantly exploring new pockets of growth”. “We have embarked on a few small property projects in Negri Sembilan and Selangor but hope to secure a major breakthrough in the Klang Valley in the future,'' he added. According to him, Sentoria's property division contributed RM114mil or 70.2% of total revenue in its financial year ended Sept 31, 2011. The remaining 29.8% or RM48.4mil was contributed by its leisure and hospitality division. “At the moment, Sentoria has land bank of 953.9 acres with a total GDV of RM2.2bil that would keep the group busy till 2020. “This includes the balance of more than 200 acres in BGRC that has been allocated for further development into additional theme parks, accommodation options and commercial interests,” said Nasiruddin. He said Sentoria was optimistic about the outlook of its leisure and hospitality division. “This is in light of our masterplan for BGRC, which include building additional three theme parks Bukit Gambang Safari Park, Marine Park and Adventure Park to attract more patrons in the coming years,” he said. Young architects practising in Malaysia will have the chance to win the inaugural LYSAGHT® Malaysia Young Architect Award which aims to develop architectural talent in the country. Organised by BlueScope Lysaght Sdn Bhd, a manufacturer and supplier of steel products for the building industry, the competition is aimed at promoting excellence in architectural design. It is open to all architects practising in Malaysia. Even non-members of the Malaysian Institute of Architects (PAM) can participate. The competition is open to participants, aged 35 years and below, and who are currently employed in an architectural firm or engaged by a property developer. “BlueScope Lysaght has an unrivalled heritage promoting architectural design excellence in Malaysia for the past 45 years, and is committed to reaching out to young, up-and-coming architects,” said company president Heon Chee Syhong, when launching the competition recently. The event encourages young architects to take the opportunity to gain exposure and share their best ideas and designs, and contribute to the field of architecture in Malaysia. The objective of the competition is focused on cultivating creative minds and promoting industry excellence by recognising innovative works of young professionals in the architectural sphere. The grand prize winner will receive RM20,000 cash, the trophy and an opportunity to establish his or her name in the building industry. In addition, the entry which gets the most votes will receive the Top Choice award and RM5,000 cash. Participation is based on the most number of public votes received by an entry through the award’s online channels such as website and Facebook page. “While there are already a few architectural awards in Malaysia, the LYSAGHT® Malaysia Young Architect Award is the only award that is dedicated to develop young architectural talents in Malaysia. As architects in Malaysia aspire to compete for international assignments, the exposure gained from their participation will certainly boost any young architect’s profile and portfolio. And the award’s online channels will elevate the exposure to a global scale,” said Heon. The judging panel include Ar. Tone Wheeler and Siritip Harntaweewongsa. Wheeler is an author, educator, consultant and active in sustainability policies. Harntaweewongsa, co-founder of a green design and consulting firm, specialises in green design strategies based on environmental analysis. For details, visit http://www.myaa.com.my/ or search for “Lysaght Malaysia Young Architect Award” on Facebook. Entries should be submitted by Sept 30 and the winners will be announced at an awards ceremony in Oct.
Pavilion Real Estate Investment Trust (REIT) posted a pre-tax profit of RM47.8 million on a revenue of RM85.3 million for the first quarter ended March 31, 2012. The group, which was listed on the Main Market of Bursa Malaysia on December 7 last year, is managed by Pavilion REIT Management Sdn Bhd. In a filing to Bursa Malaysia, the manager said 2012 would be a successful year for the group. "Barring any unforeseen circumstances, we expect Pavilion REIT to meet the year's projected distribution per unit of 5.73 sen, as disclosed in the prospectus," it said. MALAYSIA is promoting itself as a top tourist destination as well as a medical tourism hub. Every hotel operator wants a presence in Langkawi, yet not a single private hospital operator wants to be there. The Langkawi Development Authority (Lada) has even designated land in Langkawi to accommodate a private hospital and wellness facility. But, to date, there are no takers. Private hospital operators have stayed away from Langkawi for reasons ranging from lack of demand, difficulty in placing specialists on the island, to talks that the existing government hospital is under-utilised. Langkawi received 2.8 million tourists in 2011 with the numbers projected to touch 3 million in 2015. Tourism receipts are expected to double to RM3.8 billion in 2015 from RM1.9 billion in 2010. Langkawi plans to bring in high-yield tourists from countries like the UK, Australia and Saudi Arabia. It wants to increase the average length of stay to 7.4 days from 2.1 days (in 2010) and to double average daily spend by 2015. Are these future figures attractive enough to lure investors to open a medical centre? The opening of a private hospital would immediately cater to tourists who may need medical care while on vacation and employees on the island whose package include private hospital care. As it stands, patients seek treatment at the nearest private hospital - which happens to be in Penang. However, Lada's chief executive officer Tan Sri Khalid Ramli has started to promote the island as a suitable venue for medical tourism and rehabilitation. It has even started to invite international investors for this purpose. Perhaps, the investors' view is the island just doesn't need a full-fledged hospital. If this can't work, surely there are ways around it. Why not start a specialist centre with just ambulatory care or a boutique medical centre which also offers aesthetics and plastic surgery? Surely, cosmetic surgery packages in Langkawi would be a great holiday lure. If indeed the government hospital in Langkawi is vast, would creating a private wing within the existing hospital work? Then there is state-owned Khazanah Nasional Bhd which is opening hotels in Langkawi. Since Khazanah is a catalyst in many initiatives where the private sector is reluctant to take the lead and with it owning the prestigious Parkway Pantai hospital chain, maybe it can be the first mover. Unlike previously, there are tax incentives for medical centres registered with the Malaysia Healthcare Travel Council (MHTC). MHTC is the primary agency set up to develop and promote health tourism. Those registered get investment tax allowance of 100 per cent on the qualifying capital expenditure incurred within a period of five years from 2010. Private hospitals can also get double tax deduction for expenses in obtaining accreditation. Langkawi is a duty-free island. A few additional tax incentives might help bring in the players and removal of personal income taxes for doctors and specialists may tempt them to work on the Island of Le-gends.